but really close-- thanks for the tip! Have been searching for the perfect sunburst mirror! Can you share where you purchased this one? I saw one similar at Kirkland's it was black but you can spray paint it gold. Home Depot or Lowes similar not same. 70 or less. wHAT IS THE NAME OFTHE WALL CXOLOR AND IS IT BLE OR GREY? The color is Stunning by Ben Moore. It's identified in an article about this home. Sofa - What brand and color is the sofa in this picture? It would be perfect for my living room! I hope you can help. Thank you, Emily. Needless to say, I love your home ... everything you do to it is marvelous! Do you know where the shades are from or what they are called? Can you please share paint color. It is beautiful! Rug - Where can I purchase this rug? Can you share where the coffee table is from? Thanks! surround - what kind of material was used on the fireplace surround. Rug - Can you tell me where you purchased your rug? It's from Pottery Barn but has been discontinued. I purchased it at one of their outlets a few years ago. fireplace - Can you tell me what stone is surrounding the fireplace? And where you purchased it? 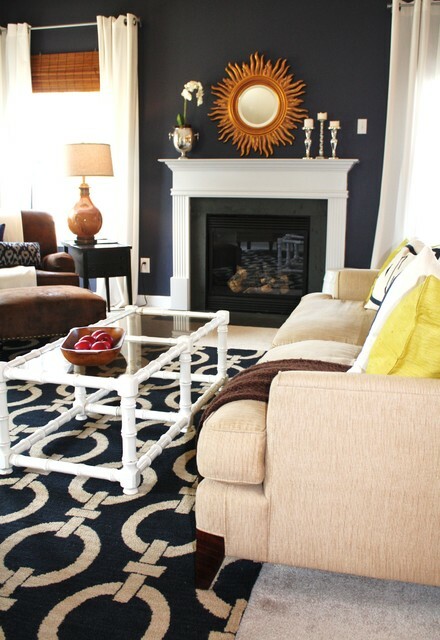 I like the flush "hearth"
Coffee Table - Could you tell me where you purchased the coffee table? Thanks! Does this color look familiar??!! 4. Navy and white. A starched white button-down topped with a navy blazer never goes out of style, and neither does a navy and white room. With this pairing, it's easy to default to the nautical approach (stripes, sailboats, white linen). But this living space turns convention on its ear: navy walls set off by crisp white millwork and a painted coffee table, with an overscale rug that ties the scene together. A traditional room in navy and white. 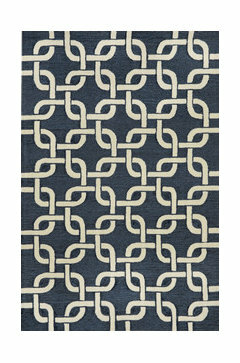 The chain-pattern rug adds to the maritime feel. 6. High contrast. Painting the wall above your mantel will make any arrangement pop. Try using deep charcoal gray, bitter chocolate or (for the truly bold) oxblood red to create a rich backdrop. A flash of gold, like this sunburst mirror, brings the glamour. Laura Gaskill added this to Decorate With Intention: Finish That Room! May look nice in front room around the fireplace.